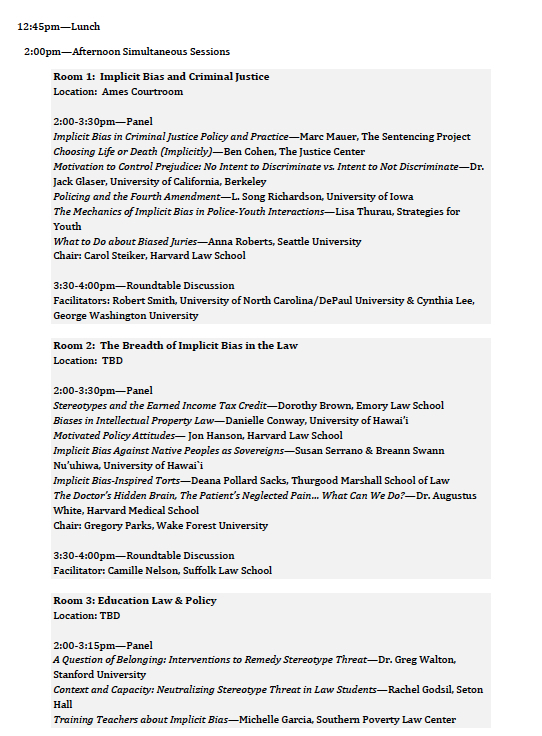 Presenters include Situationist Contributors Mahzarin Banaji, Jon Hanson, Jerry Kang. “Despite cultural progress in reducing overt acts of racism, stark racial disparities continue to define American life. 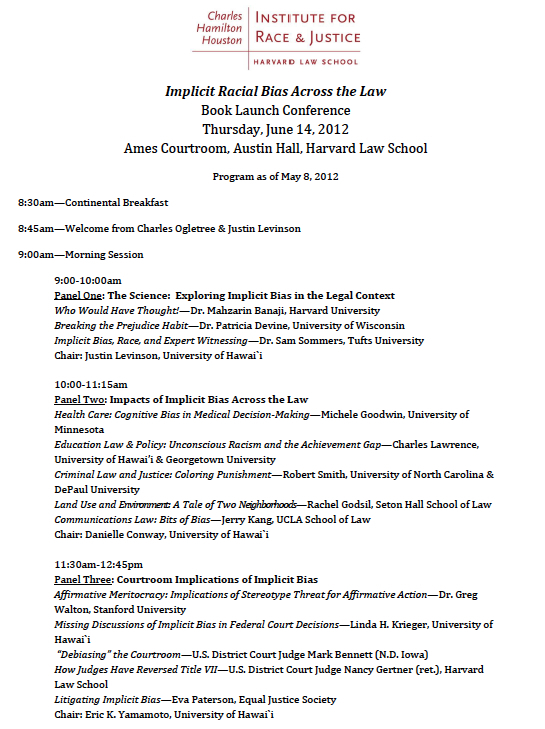 This conference considers what emerging social science can contribute to the discussion of race in American law, policy, and society. The conference will explore how scientific evidence on the human mind might help to explain why racial equality is so elusive. This new evidence reveals how human mental machinery can be skewed by lurking stereotypes, often bending to accommodate hidden biases reinforced by years of social learning. 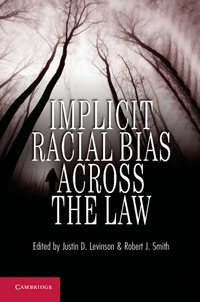 Through the lens of these powerful and pervasive implicit racial attitudes and stereotypes, the conference, designed to coincide with the launch of the book “Implicit Racial Bias Across the Law”, examines both the continued subordination of historically disadvantaged groups and the legal system’s complicity in the subordination. 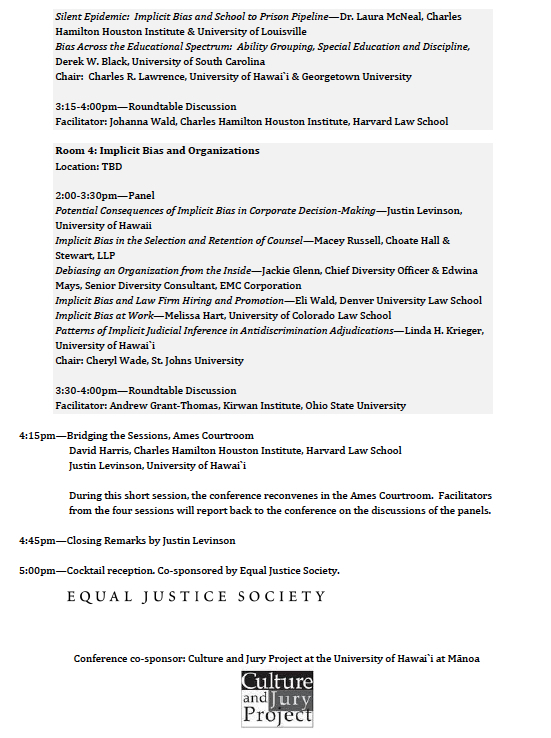 Here is the conference agenda. This entry was posted on June 12, 2012 at 12:01 am	and is filed under Events, Implicit Associations, Law, Legal Theory, Situationist Contributors. You can follow any responses to this entry through the RSS 2.0 feed. You can leave a response, or trackback from your own site.